'It's all about anticipation', a friend has told me. I was too young to fully understand what he meant. Or to taste the pleasure of desire. I just read more about dopamine and I was surprised to find out that 'It has been argued that dopamine is more associated with anticipatory desire and motivation (commonly referred to as "wanting") as opposed to actual consummatory pleasure (commonly referred to as "liking"). The thrill. Might happen that the pleasure of the act is bigger or smaller. But the wanting, the waiting, the emotions involved are the source of big pleasure. Like all people with passions that is a big part of the life of a perfumista (I'm still confused with the word). It is about smelling but it is a lot about anticipation. The usual visit to perfume counters even puts me in such a thrilling mood. I always feel like that will be the day, I shall discover something special. And how many times, anticipating a big meeting with a new ravishing perfume it happened to be disappointed. Even by big niche names or rare exclusive fragrances. Waiting with excitement for the new pack with samples, dying to smell that or that. And the end might not be such a big deal. But what a wonderful time I had anticipating the moment. So many times the pleasure was much bigger than the actual smelling. Of course, harder to get the object of desire bigger the pleasure of anticipating it. Take Ormonde Jayne perfumes. I waited for the opportunity to visit London and smell Ormonde Jayne perfumes in that wonderful shop. Didn't work. Finally Santa brought me the sample pack. I would have put all my money on Ormonde Woman. It turned out to be fantastic. 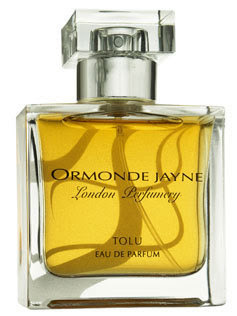 Still, for me the absolutely winner is Tolu of Ormonde Jayne line. When did I smell last time such an intoxicating perfume? I can't remember. There must be a room in hell for people who love intoxication perfumes and smelling Tolu will get you a place there. It's the smell of secret pleasures and sins. There is the very attractive but dark orange blossom at the beginning. Very soon what I get mostly is a fresh fish smell. Do you know how the fresh fish smells when you clean the skin of the fish, a metallic bit dirty odour? Or how the fish fat smells? Is that the civet? (Linda Pilkington , the author of Ormonde Jayne perfumes, says she used real civet tincture in Tolu) I have no idea, but this strange 'aroma' stays in between the orange blossoms and amber like an undiscovered dangerous territory, It gives an unbelievable attractive quality. When I say metallic I don't say cold, because Tolu has huge warmth. I was shocked a bit, I didn't read anywhere about it and it was totally surprising. You smell it clear when you put your nose in to it while the silage which comes out is breathtaking beauty. I am still under the fascination of this distorting note which gives such an original twist. It is strange, because Tolu has a classic feeling in it's beauty but nevertheless surprising.